The TORPEDO BAG LOREDO is a small, lightweight but strong hard shell case that offers exceptional protection at an affordable price. The case can support over 400 pounds of dead weight (you may have seen photos of this case with a car parked on top of it). Designed for professional, college & high school trumpet players who want a case that is uncommonly protective. These cases can fit anywhere, including under aircraft seats or in overhead bins. A small detachable internal compartment is useful for mouthpieces, valve oil and a few other small accessories. Great for pros, travelers, freelance artists and students! Every Torpedo Bag is covered by a manufacturer's Lifetime Warranty which covers the repair or replacement of any case found defective in material or workmanship when put to normal use. Black top grain leather exterior. 2 x 1/4 inch thick shoulder strap. Mouthpiece storage in the lid. 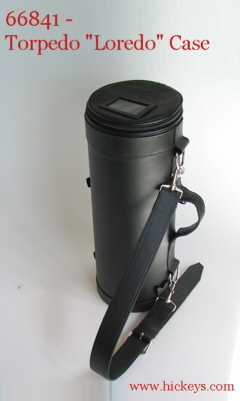 Matching mute carrier available, see item 78984. Matching music carrier available, see item 78985. Dimensions: Cylindrical. Approx 24 inches (61cm) long x 9 inches (23cm) wide.